These political parties are contesting for seats in the 2019 National Assembly elections on 8 May 2019. 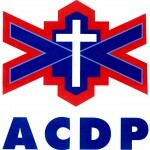 Launched in 1993, one of the ACDP’s unique claims to fame is that it was the only party to reject the South African Constitution – on the basis that it enshrined the right to abortion. Supports a return to “biblical principles”, including the imposition of the death penalty. Led by Dr Kenneth Meshoe, the ACDP received just over 104,000 votes nationally in the 2014 elections, giving it three seats in the National Assembly. National Executive Commitee: Rev Kenneth Meshoe MP – President, Wayne Thring – Deputy President, Jo-Ann Downs – Chairwoman and Raymond Tlaeli – Secretary General.